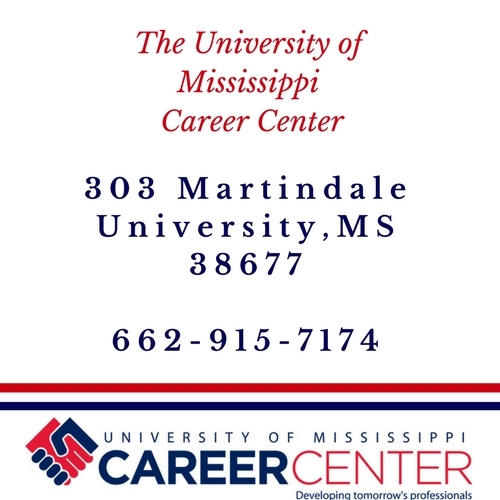 The Career Center is located at 303 Martindale Student Services Center near the heart of the Ole Miss campus. Martindale is just across from both the Turner Center gymnasium and the Center for Intelligence and Security Studies building and backs up to the J.D. Williams Library. 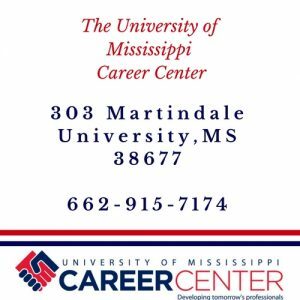 Visit http://www.olemiss.edu/cmap/ to view a campus map. Office hours are 8 a.m.-5 p.m. Monday through Friday. From the airport, take I-240 West to I-55 South until you reach Batesville, MS. In Batesville, take exit 243, the Oxford/University of Mississippi exit. This exit will enter Highway 6 East. The University of Mississippi is located approximately 30 minutes from this exit. As you enter Oxford, stay on Highway 6 East until you see the Chucky Mullins Drive exit. Take this exit and turn left onto the bridge over Highway 6. Continue through three stop signs; at the fourth stop sign, turn right. You are now driving on Fraternity Row. Continue through another stop sign. The Career Center is located in Martindale Student Services Center, the second building on the left past this intersection. You may park in any legal parking spot in front of the building or the lots across the street. Take I-55 North toward Grenada to Batesville, MS. In Batesville, take exit 243, the Oxford/University of Mississippi exit. This exit will enter Highway 6 East. The University of Mississippi is located approximately 30 minutes from this exit. Take Highway 78 West toward Memphis, TN. Stay on Highway 78 until you see the Oxford, MS exit (Sherman-Pontotoc). Take this Oxford exit and turn left at the stop sign. This highway is Highway 9. Continue on Highway 9 for approximately 20 minutes until you see “Oxford exit next right.” Take this exit. You are now at the beginning of Highway 6 heading west toward Oxford. As you enter Oxford, stay on Highway 6 West until you see the Chucky Mullins Drive Exit. Take this exit and turn right. Continue through three stop signs; at the fourth stop sign, turn right. You are now driving on Fraternity Row. Continue through another stop sign. The Career Center is located in Martindale Student Services Center, the second building on the left past this intersection. You may park in any legal parking spot in front of the building or the lots across the street.